Battle of Britain (1940) and Anthony Bartley. 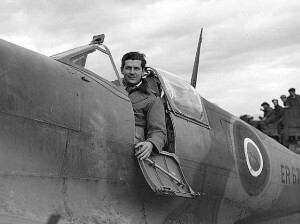 Squadron Leader Anthony Charles Bartley DFC (28 March 1919 — 18 April 2001) was an RAF Hurricane and Spitfire fighter ace who was awarded the DFC after scoring eight victories against enemy aircraft during the Battle of Britain. He was born in Ireland, the son of Sir Charles Bartley, an Irish barrister who served as a judge in the Calcutta High Court. Anthony grew up in Swanbourne, living with his parents at The Cottage, opposite the Old House. He was educated at Stowe School (Buckingham) and in 1938 learned to fly. He joined the RAF in 1939 on a short service commission, and was posted to No. 92 (East India) Squadron in November 1939 based in Sussex with the fighter version of the twin engine Bristol Blenheim. 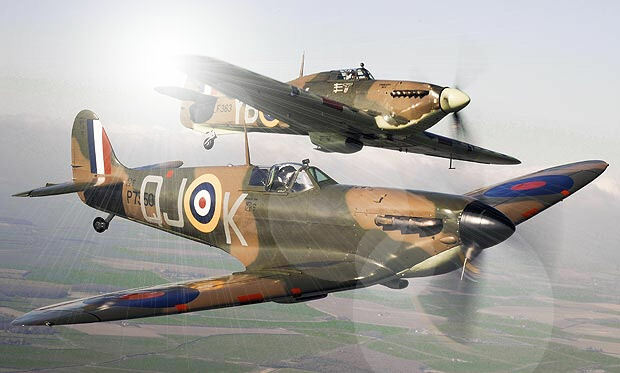 After the Blenheims were replaced by Hurricanes and Spitfires, he fought over Dunkirk during the Battle of France and evacuation of the British Expeditionary Force. At Dunkirk, he attacked formations of He111’s from under them, where their defensive machine gunners could not see them. Five Heinkels were set on fire before he ran out of ammunition (Bartley, A., 1997). He flew a Hurricane then a Spitfire with the Squadron which was based at Biggin Hill through the Battle of Britain, and was awarded the DFC in October 1940. Anthony was an exponent of attacking the enemy with the sun behind. This tactic had a devastating effect on the Luftwaffe. Losses of German aircraft were so high that Hitler decided to postpone the invasion of Britain. 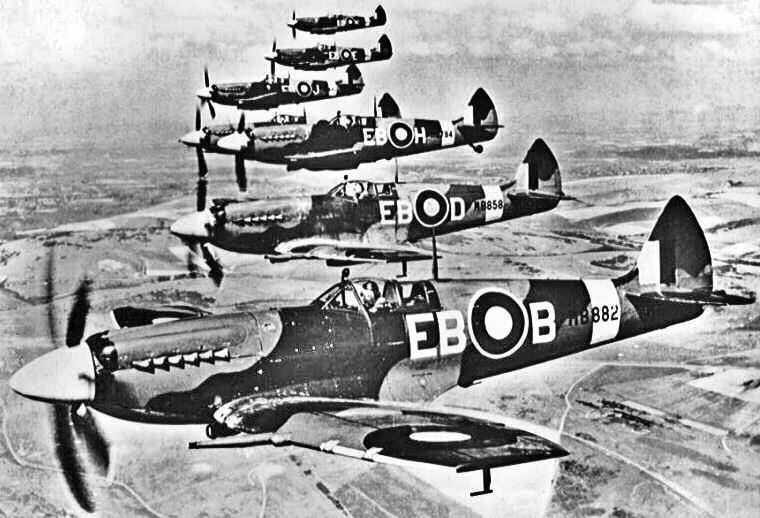 A formation of Supermarine Spitfires, 1940. A Spitfire & Hurricane approach with the sun behind. Anon. RAF fighter pilot, 1940. The tactic, however, was also subsequently employed by German fighter escorts, so RAF pilots would say ‘Remember the Hun in the Sun’. Stories are recorded (Reading 1994) of Anthony sometimes passing low or performing victory rolls over the village school (if he was flying over North Bucks) to the great delight and cheers of the schoolchildren of Swanbourne. When based at Biggin Hill, Squadron 92 gained something of a reputation for hard partying when on leave in London, a distance quite close to base, sometimes with fast cars fuelled up on high octane aviation fuel! CLICK to view footage of the war in the air, 1940. Anthony Bartley in his Hurricane in 1940. In March 1941 he was posted as a flight commander to No. 74 Squadron RAF at Manston in Kent. In May 1941 he served as a flying instructor at No. 53 Operational Training Unit and No. 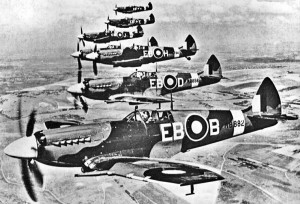 56 Operational Training Unit (OTUs), before moving in July 1941 to Vickers-Supermarine as a production test pilot, and made a significant contribution to the further development of the Spitfire. During this time he performed the aerobatics for the film “The First of the Few“, which chronicled the life of the Spitfire’s designer R J Mitchell, as played by Leslie Howard. In August 1942 Bartley was posted to command of No. 111 Squadron RAF and led it to North Africa for the November Operation Torch landings. He shot down several enemy fighters over Tunisia, including at least three Bf-109s. His tour ended in January 1943 and was awarded a bar to his DFC the following month. He then served on the staff of No. 83 Group, before departing in October 1944 for the USA to attend the Command and General Staff College. Here, he also lectured on fighter tactics to the Americans. At the end of the war his combat total included 13 enemy aircraft destroyed, 1 unconfirmed destroyed, 5 probably destroyed and 8 damaged. Subsequently, Anthony was introduced to the British Actress Deborah Kerr through Stewart Granger, who warned him never to marry an actress because she will always “put her career first”. However, looking to settle down at the end of World War 2, Anthony confided in David Niven, British film star and fellow old Stoic (ex. of Stowe School Buckingham), who helped him to compile the wording of a telegram to Deborah proposing marriage. Deborah accepted the proposal, and on moving to California with Deborah to further her career, Anthony became a television producer. Further Reading:- Smoke Trails in the Sky By Tony Bartley DFC, 2nd Ed. 1997; published by Crecy Publishing Ltd.